Have the lazy days of summer lulled you into a cooking rut? If your in this situation and wondering what your gonna do, no worries, I have the cure for the summertime cooking blues. Throw on a good ole country tune like Alan Jackson's Summertime Blues and put together this barbecue chicken dish that's full of bright summer flavors. It's hard not to feel good listening to this sunny tune and this no-fuss dish will keep the summertime cooking blues a bay...Yee-haw! In a small bowl whisk together Italian dressing, lime juice, chili powder and thyme. Place chicken breasts in a large resealable plastic bag. Add marinade, seal bag and turn bag several times until chicken is coated. Marinate in the refrigerator for 2 to 4 hours. Preheat grill to medium setting. Place chicken on grill and discard marinade. 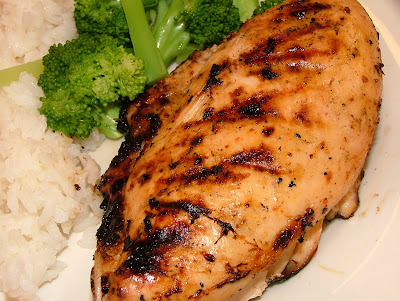 Grill until chicken is no longer pink in the center but still moist, about 5 to 6 minutes per side. Remove chicken from grill, cover loosely with foil, and let rest for 5 minutes.